Weimaraner Dogs LOVE Dog Beaches! A dog friendly beach is a great day trip destination for you and your dog, and taking your dog to the beach while on vacation, makes your vacation so much more fun! 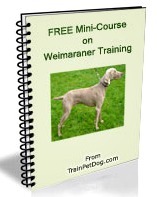 Weimaraner dogs just LOVE to run and play on beaches! And, more and more, the tourism crowd is recognizing that people like to take their dogs on vacation. Hence, dog friendly beaches are becoming more common. If you think about it from your dog’s viewpoint, a dog friendly beach is really just a giant playground for you and your dog. Your Weimaraner really doesn’t care whether you are in the woods, running through a field or at the beach. Everywhere that you “play” together, is fun for him! And, running and playing with your dog at the beach keeps both of you healthy and fit. 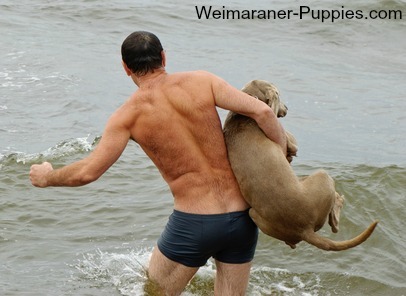 In addition, if your dog is young, the beach activities will help to socialize your Weim. He will get to interact with other dogs and with new people! People are naturally attracted to dogs, and they want to pet and interact with friendly dogs on the beach—guaranteed. with you at a dog friendly beach! If you live near the ocean or a lake, a trip to a dog friendly beach, even for just 30 minutes, is a great way to get those Weimaraner wiggles out. Your dog will be ready for relaxation when she gets home—after running through the sand, and jumping in the water! A dog friendly beach may not provide water for your dog. Make sure you take a supply of fresh water and a collapsible travel bowl for your dog. Here are some examples of dog friendly beaches. You may live close to one, or you might go to one of these beaches on vacation. Del Mar, California is known as a dog friendly city, with its 2 miles of dog friendly beach areas and its 2 large dog friendly parks, Seagrove Park and Powerhouse Park. There are three beaches that allow dogs, at least for part of the year, but the most popular is North Beach. North Beach, known by the locals as “Dog Beach”, is north of 29th Street and goes for about ½ mile, to Solana Beach. North Beach is a dog friendly beach year-round, but your dog must be leashed from June 16th to Labor Day. After Labor Day, through June 15th, your dog can run free, as long as she listens to your voice commands. This lovely beach was named “America’s Best Beach” by Trip Advisor in 2009, and in 2005 “Dr. Beach,” named Fort De Soto the nation’s #1 Beach. Fort DeSoto Beach has two fenced in dog friendly beach areas, for large and small dogs (with water for thirsty runners). With a large number of dogs, they do have some rules, and many are just common sense. Your dog must have a license and be current on rabies vaccination. When entering or leaving the dog friendly beach area, your dog must be on a leash. She must be under control at all times. No dogs in heat and no aggressive behavior. Of course, you are required to clean up after your dog. This pretty beach friendly beach on Lake Michigan boasts a lighthouse and beautiful wind-carved dunes. The sand is soft and not rocky. The park was featured on ABC’s Good Morning America, as the “most beautiful place in America”. There are some “no pet” areas in the park, so make sure you pay attention to the signs. If you are a hiker, consider taking the Dunes Trail, a 3.5 mile long hiking trail that meets Lake Michigan at the half-way mark. This is a pretty dog friendly beach with soft sand and huge rock formations, like the famous Haystack Rock. Dogs are permitted on the beach, as long as you have them under control—either by voice commands or leash. The beach is about an hour from Portland, and it’s also close to Ecola State Park, where you can take your Weimaraner hiking. This Outer Banks vacation area has 11 miles of lovely beaches, mostly wide open, with very few buildings. Dogs are allowed on the beach year-round. Beach rules for dogs include keeping your dog under control with a leash (no longer than 10 feet long), and your dog must be licensed and have a current rabies shot.As with other beaches, you are required to clean up after your dog. Dog on the Beach Etiquette Advocates for dog friendly beaches work very hard to keep designated off-leash sections of the beach open to the public. It’s important to remember that off-leash dog beaches are a privilege. Often, dogs are permitted on the beach only during off-season times. Fall is an especially nice time to romp and play with your dog on the beach. So that public beaches are clean, safe, and fun for everyone, there are certain guidelines that should be followed. When in doubt, take a look around and see what everyone else is doing. Bring your own bags, just in case. Do not bury your dogs mess in the sand, pick it up! Your dog could get lost, or may end up in a confrontation with another dog. Just like you wouldn’t take your eyes off your kid at the park…don’t take your eyes off the dog. Maintain control of your dog at all times. Your dog must be well behaved and must listen to your verbal commands. Abide by the leash laws. The majority of beaches that allow dogs do require them to be leashed. You may be fined by officials if you disobey leash laws. When leash laws are ignored you risk the privilege of having an off-leash dog beach. Where dogs are allowed to be off-leash, we recommend keeping the leash on until you reach the wet part of the sand. Be considerate of other beach goers. It’s unlikely that you and your dog are the only ones on the beach. Don’t let your dog go where it’s not welcome. Keep your dog from trampling over sunbathers, and small children.